Makimuku Station is a quaint little train station in a small town in Nara Prefecture, Japan. Lately archaeologists have found artifacts dating back to the 3rd century, as well as building foundations that could make this place the oldest settlement in Japan. For now however, Makimuku still remains a tiny, naturally beautiful agricultural town, and home to natural farmer Yoshikazu Kawaguchi. 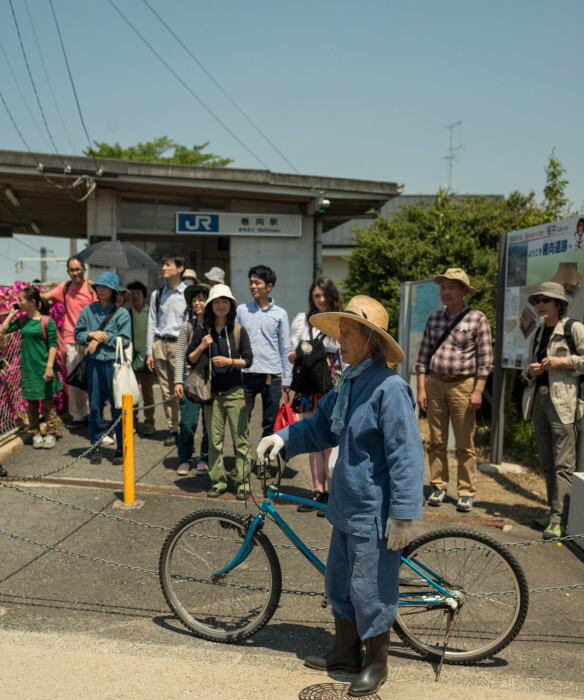 Recently, every few months, Kawaguchi holds an open farm day, making his way to Makimuku Station on his bike to greet a group of people from all over the world. 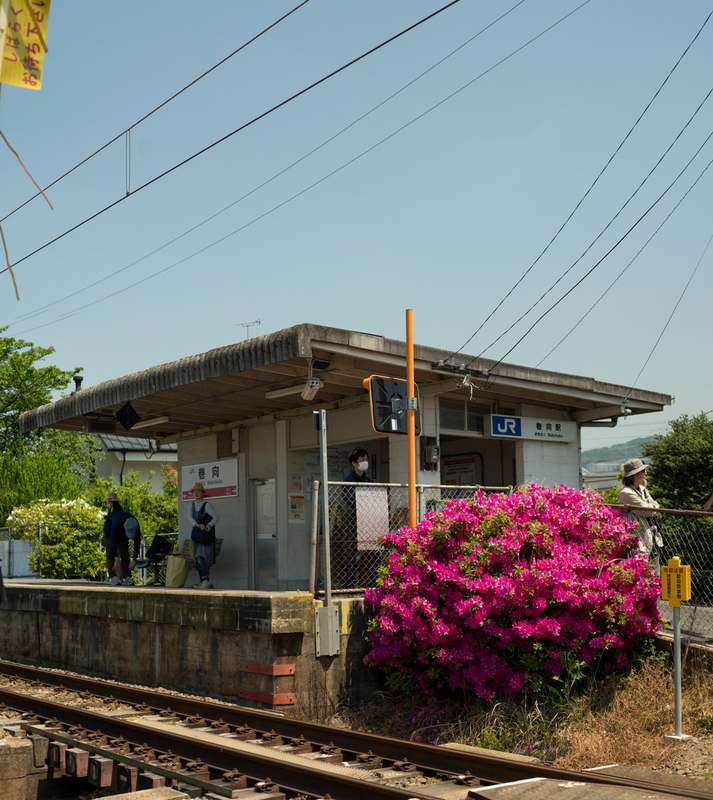 On these days, the daily ridership on the little Sakurai train line is probably doubled! Our Japanese producer Kaori Tsuji was there with us to help translate Kawaguchi’s words, but his farm is really one of the places that needs no translation or words; the field can so easily and powerfully tell you what you need to know by itself. Kawaguchi’s fields are markedly different from those that surround him. 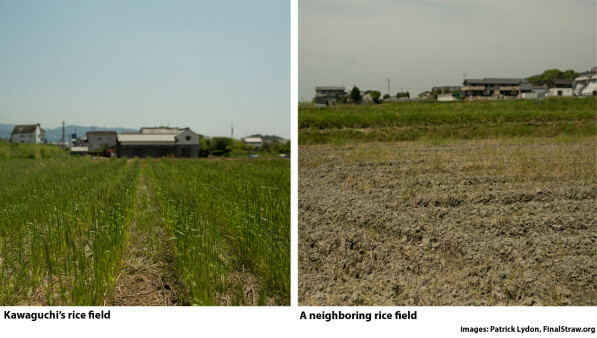 The image below compares Kawaguchi’s field (left) with a neighbor’s field (right). I took the images on the same day. The field on the right is a conventionally tilled field — it could be chemical-based or organic, the difference is negligible for this example (indeed, that’s a story for another time). The visible difference you see on the right is in the tilling of the soil. 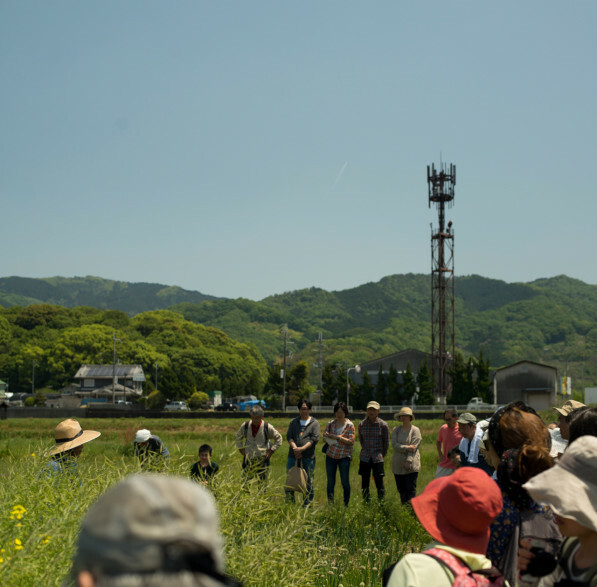 The farm at left is Kawaguchi’s, it represents a mindset where humans are engaged in a nurturing and regenerative relationship with nature, a relationship which is mutually beneficial, resulting in growth and health for the land and humans. The farm at right is a conventional farm, it represents a mindset where humans are constantly engaged in fighting against and attempting to control nature, a relationship which is mutually degenerative, causing suffering both for the land and for humans. It’s worth noting that the dead and dusty looking image on the right would be considered a “best” case in how we conduct nearly all of our farming in the contemporary westernized world; most of the places where the food on a supermarket shelf comes from are in far worse condition, as are all of the environments downstream. You’ll notice grain and weeds and all sorts of things growing in Kawaguchi’s field, but it’s not rice season yet. This kind of growth is a positive thing for the natural farmer. 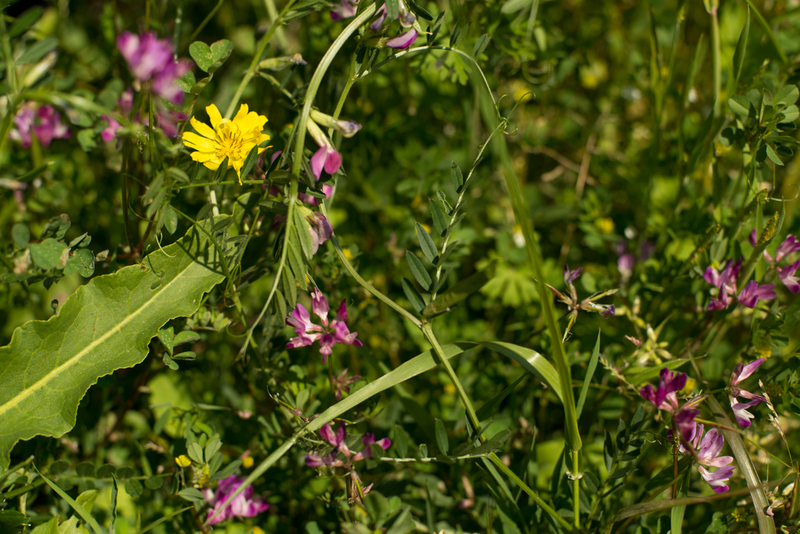 Having a diverse and steady growth in a field helps capture all of that free and amazingly powerful solar energy all year long, and provides a home for the plant and animal life that is critical to building soil nutrients that are needed to grow food without chemicals or fertilizers. Here, natural means allowing nature to do what it does best. Conventional farming teaches us the opposite; instead of allowing nature to capture that solar energy, we turn that solar energy into a weapon against the soil. Once tilled and exposed to the sun, not only do the plants cease photosynthesis, but the soil is quickly sterilized, removed of the living organisms that give the soil its richness. Instead of providing a nurturing, regenerative environment where nature can regain its health, our industrial ways of farming enact all sorts of methods to kill everything but the crops that we want to grow. In our selfishness to grow only one thing in a field and to destroy all other life there, we end up systemically removing everything that the soil needs to grow food as well. Fertilizer and chemicals then become a requirement. With the mindset that we must fight against nature entrenched in our minds, we guarantee that the field will suffer, that humans will suffer, and that the soil will need added chemicals and fertilizers for eternity in order to grow anything. This is a great mindset for industry. Not so great for the earth, the people, or anything else. In the end we can either continue to fight against nature, creating conditions that both scholars and practitioners tell us will end in the downfall of agriculture and humanity as we know it; or we can learn to work along with nature, creating fields of life that allow nature to do its miracle and further the regeneration of nature and humanity together. If that sounds extreme and polemic, it’s because the reality of our situation is extreme and polemic. A recent report by the United Nations Food and Agriculture Organization gives us less than 60 years of industrial farming until we destroy our very means of growing food. It was a generous report. In this very moment, you and I have a choice, and that choice will effect whether or not our children and grand children can live happily on this earth. We should take that choice seriously. 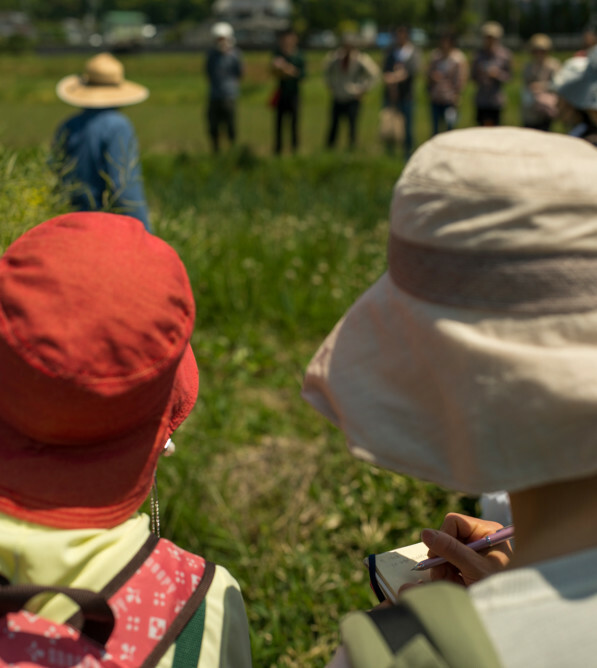 This choice also benefits our ability to live happily and healthily; for one of the greatest joys in life is to step into a field such as Kawaguchi’s rice field, and to be in the midst of the rich reality of our life on this earth, to see, feel, smell, hear, and enjoy this relationship between ourselves and nature. To know that we are a part of something bigger than only ourselves. Happily, we have already met many thousands of people from cities and towns around the world who are choosing to reject business, politics, and culture as usual and instead to enter a life based on the reality of this earth. It was good to meet a small few of this kind of people (60 of them) at Kawaguchi’s farm day.